In a medium saucepan, heat the chicken broth to a simmer. In a separate saucepan, melt the butter over medium-high heat. Add the shallots and mushrooms to the butter, cooking until fragrant and translucent, about 2 minutes. Add the Arborio rice and lightly toast, stirring to coat in the butter and shallots. Add the white wine, continuing to cook while stirring until the wine is absorbed. 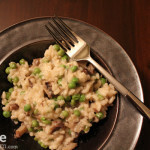 You should be able to run your spoon through the risotto and have the indentation stay. Using a ladle, add enough of the warm chicken broth to cover the rice, stirring constantly over medium heat until the broth is completely absorbed. Repeat this process 3 more times, adding the broth in stages while continuing to stir. Once all of the chicken broth has been added and the rice is tender, add the peas, lemon juice and lemon zest and stir to combine. Remove from the heat and stir in the parmesan, mozzarella and season with salt and pepper.